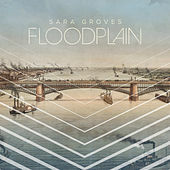 Singer/songwriter Sara Groves is the embodiment of “still water runs deep,” so it’s not surprising her new album is titled Floodplain. Through a dark season of depression, anxiety and writer’s block, this Minnesota mom learned that living on the precipice can make life richer, but that unique view comes with risks. Her tender heart may be waterlogged, but those difficult years have given Groves’ piano-driven pop more substance. Two years in the making, this hauntingly beautiful release can be boiled down to trusting God and living life fully aware.